COMET FLORENZ COLD ONLY TAP FOR SMEV, DOMETIC, THETFORD & CAN SINKS & COMBINATION UNITS. Folding single lever cold only tap Chrome effect with microswitch. 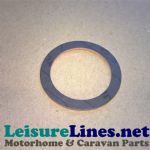 40mm high so suitable for Smev, Dometic, Thetford & CAN folding glass lid sinks. Minimum Installation hole is 33mm. Thread length 35mm. Spout length 150mm. 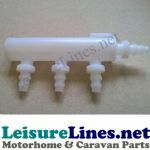 Supplied with 10/12mm 1/2" barb cold water connection.